on investment with very low installation cost. Avdel®, DEWALT®, Powered by DEWALT®™, POP® and ProSet® are registered trademarks of Stanley Black & Decker, Inc. and its affiliates. Data shown is subject to change without prior notice as a result of continuous product development and improvement policy. 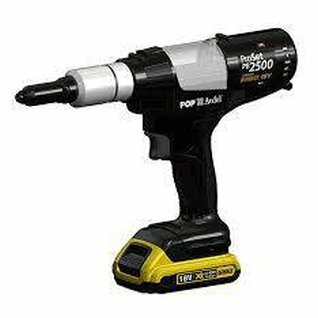 The POP PB2500 battery operated tool brings the latest cordless technologies to blind rivet setting performance for use wherever and whenever it's needed. Install rivets at assembly stations where no air supply is available or along a moving line. 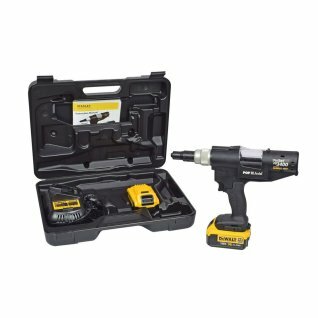 New award winning tool design and high performance Li-Ion battery enhancements provide overall improved efficiency, durability, ergonomics and appearance.